Handmade sterling silver necklace brightens everyday looks with an uplifting message. Handmade sterling silver necklace adds nature-inspired charm to everyday looks with a sweet pendant design. Sterling silver make this pendant necklace a top pick for both dressy and casual ensembles. 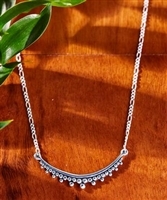 Dangle subtle shine from your neck by donning this simple and classic necklace cut from shimmering sterling silver. Gleaming sterling silver lends a luminescent finish to this sleek layered pendant necklace that features polished sphere charms for minimalist allure. Adorn you neck with subtle, boho-inspired elegance by adding this gleaming sterling silver necklace that features an embellished bar pendant. Bold, leaf-inspired charms adorn this sleek statement necklace that's bathed in gleaming sterling silver for a luxurious finish. 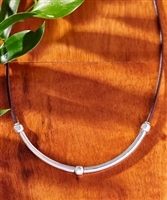 Secured by a supple leather cord, this sterling silver necklace adds sleek polish to your ensemble with its minimalist profile.